Mard Ko Dard Nahi Hota is about Surya (tributes to Tamil cinema abound in this film, the hero is named after Rajinikanth’s Surya in Thalapathy), who cannot feel pain because of a medical condition and his desire to find and serve cold justice to a ‘chain thief’. Abhimanyu Dassani is endearing as Surya. 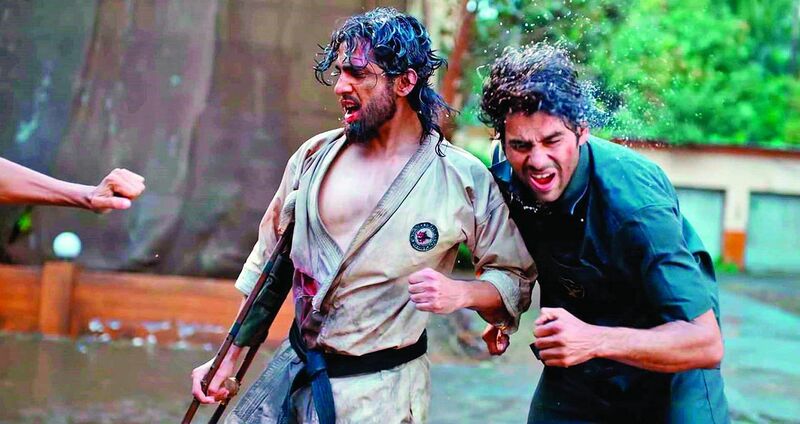 His childhood friend Supri (Radhika Madan) rejoins him as he enters adulthood to help him fulfil another dream – to fight in the 100-man karate kumite with his inspiration Karate Mani. Gulshan Devaiah as twins Karate Mani and Jimmy is fabulous, but especially more fabulous as the villain who wears a thali that’s right, he’s wearing a thali around his neck. Mani, Supri and Surya try to wrest it from him for Mani. The cast is small but tight, and everyone has something memorable to offer. They work together so well. Supri is Mani’s student and is neither a prop nor a damsel in distress. But that doesn’t mean she is just a strong woman who does not get an arc of her own. This is good writing. Supri has a controlling fiancé with whom she’s supposed to go settle in Canada, and then her mother can undergo treatment there. Supri must choose between her life here in India and the way of life she wants--fighting crime mostly (hurrah)--and the life of a desi wife (to a rather surly man) in videsh. The big deal about the film is that it does not make a big deal of things others would stand on top of rooftops and shout out loud about. Supri and Surya do make out on a rooftop. The next day, she simply, literally waltzes down to the nearest pharmacy, asks for the morning after pill and some water, gulps it down and goes back to kicking *ss. There’s a lot to love and cherish about Mard Ko Dard Nahi Hota that goes beyond the nostalgia, the kitsch and the pastiche of 90s and 80s, and that’s what makes it special.